WASHINGTON - The U.S. Postal Service will commemorate the 200th anniversary of the nation's oldest federal cultural institution on April 24, 2000, when it issues the Library of Congress postage stamp. "This is an important milestone in the nation's history," says Henry Pankey, Postal Service Vice President for the Mid-Atlantic Area. "Postage stamps are a 200-year-old tradition that chronicle the events, people, and places that have helped shape this great country. We are proud to join the Library of Congress as they celebrate their bicentennial anniversary this year with the issuance of the Library of Congress stamp. We hope that in doing so, Americans will be reminded of the tremendous contribution the Library of Congress has made to our democratic way of life." The first day of issuance ceremony will take place in the Thomas Jefferson Building at the Library of Congress at 10 a.m. In addition to Pankey, other honored guests will include the Librarian of Congress, James Billington; President of the American Library Association, Sarah Ann Long; Deputy Librarian Donald Scott, and stamp designer Ethel Kessler. Washington, D.C. Postmaster Delores J. Killette will serve as Master of Ceremonies for the event. The Library of Congress was established by an act of Congress and approved by then-President John Adams on April 24, 1800. It preserves a collection of nearly 119 million items. In addition to its primary mission of serving the research needs of the U.S. Congress, the Library serves all Americans through its popular Web site and its 21 reading rooms on Capitol Hill. The Library's bicentennial goal is to "inspire creativity in the century ahead by stimulating greater use of the Library of Congress and libraries everywhere." What started with fewer than a thousand books has grown into a collection of millions of items in all formats. Books, films, photographs, prints, maps, sound recordings, musical scores and digital materials are included in the Library's collections. "I encourage Americans to participate in programs and activities marking our 200th birthday," says Librarian of Congress James H. Billington. "As you reflect on our nation's accomplishments during the past century, you may recall the Jeffersonian principle upon which the Library of Congress was built that free access to information and knowledge is one of the cornerstones of democracy." 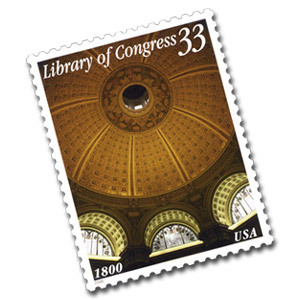 The stamp art is a color photograph of the interior dome and several of the arched windows in the Main Reading Room of the Thomas Jefferson Building at the Library of Congress. This photograph was taken by Michael Freeman in 1980. The selvage image is based on a historic photograph of the exterior of the Jefferson Building. Ethel Kessler of Bethesda, Md. is the stamp designer and art director of the Library of Congress stamp.